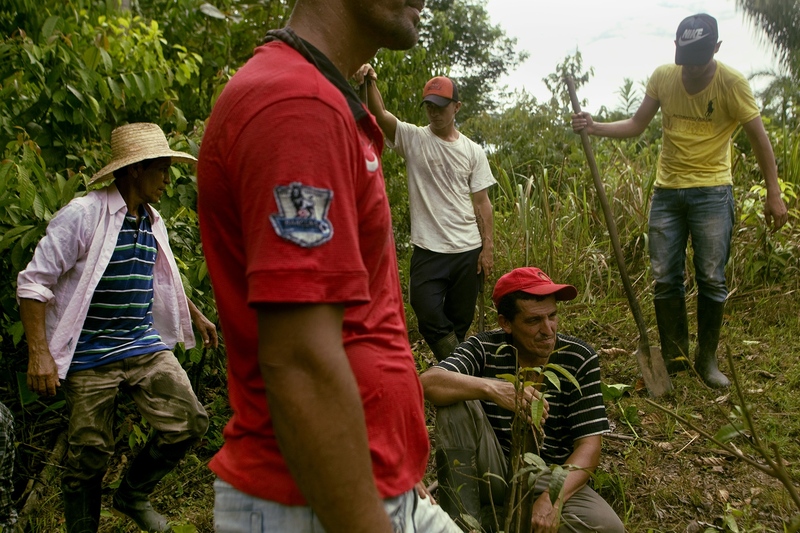 Over the last 30 years, Colombia, the world´s largest coca-cocaine producer, has experienced the worst of The War on Drugs, and its poor and marginalized rural communities have shouldered this burden disproportionately. Around sixty thousand families grow coca in Colombia and total of five hundred thousand people live off the farming and poicking of the crop. 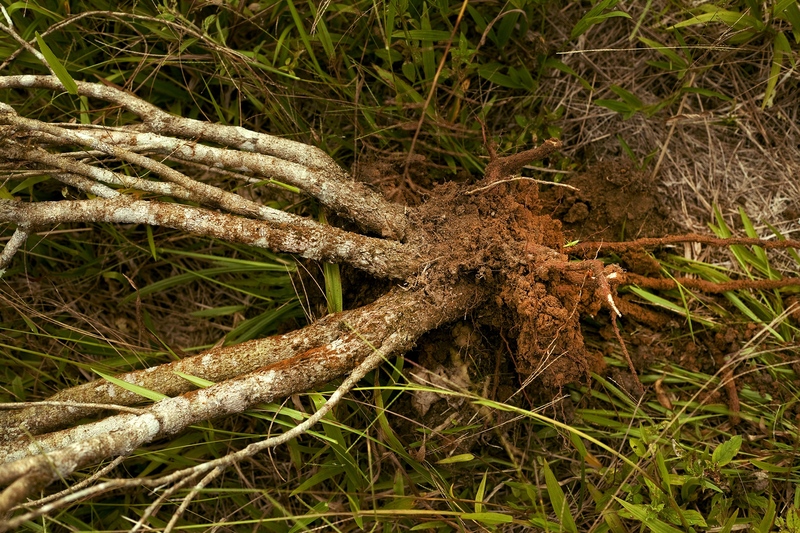 It is the least profitable activity of the coca-cocaine trade market since coca farmer can receive as little as three thousand dollars a year per each hectare cultivated. 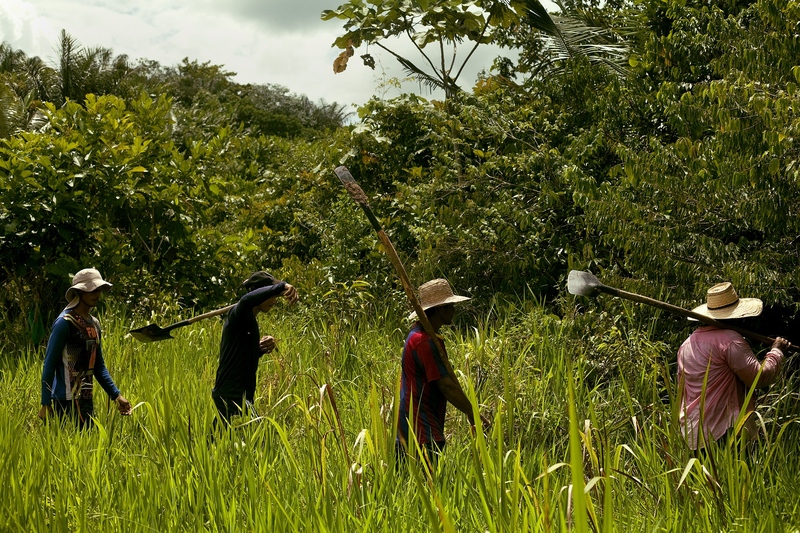 Coca growers and "raspachines" or "pickers", rely on cultivating coca to support their families. 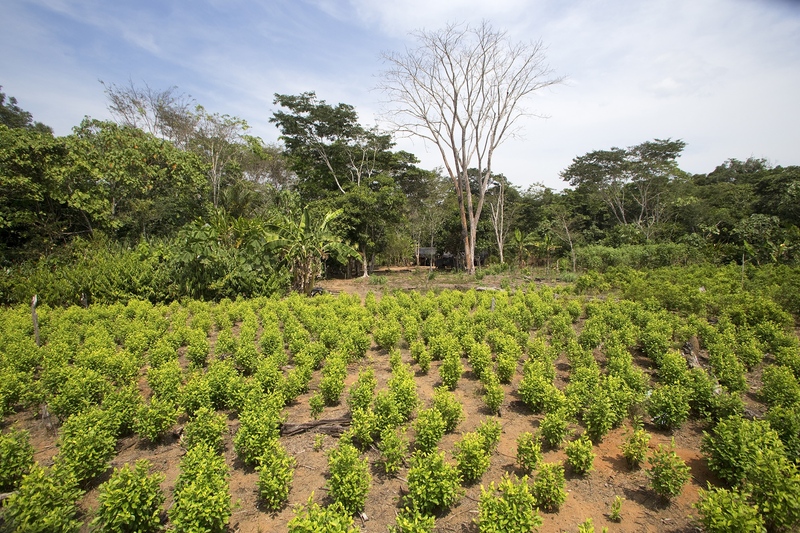 Lack of state presence and high levels of Unsatisfied Basic Needs (UBN) has pushed these communities to illegally grow coca; the war on drugs has further marginalized this population to the point where they are forcedly displaced and manipulated by violent groups. With the consumption of illicit drugs rising alarmingly in Colombia and with the new prohibitions imposed by the government of President Duque, there are fewer and fewer spaces to effectively help Colombian consumers. 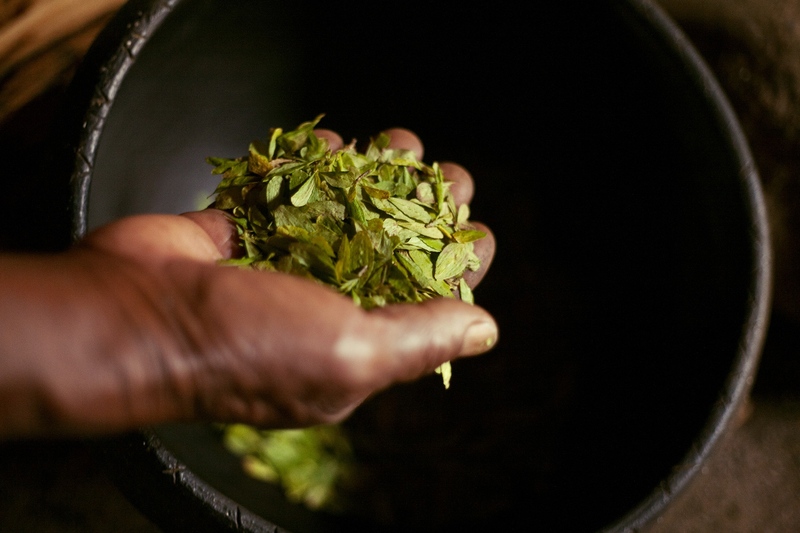 In the framework of the peace process signed with the FARC, voluntary eradications of the coca leaf matte are being implemented by the former growers of this plant, with limited successes. 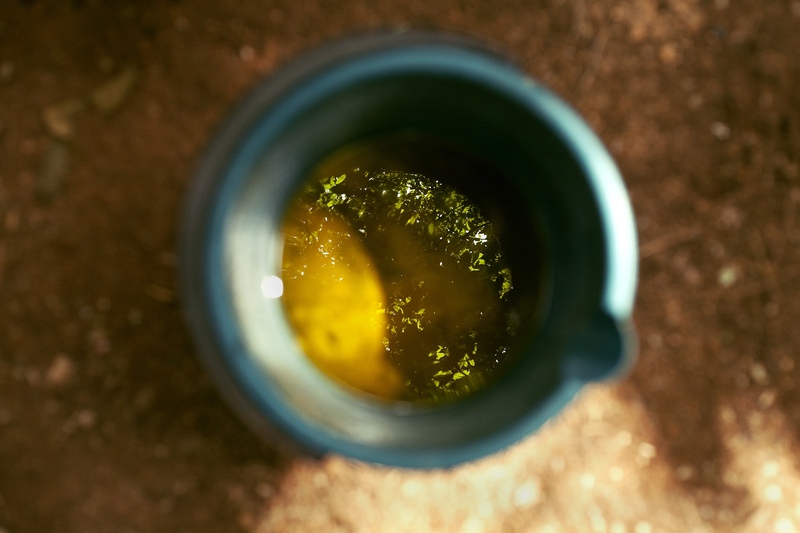 The natives of almost all Colombia use the sacred plant of Coca, for their rituals and their daily life. 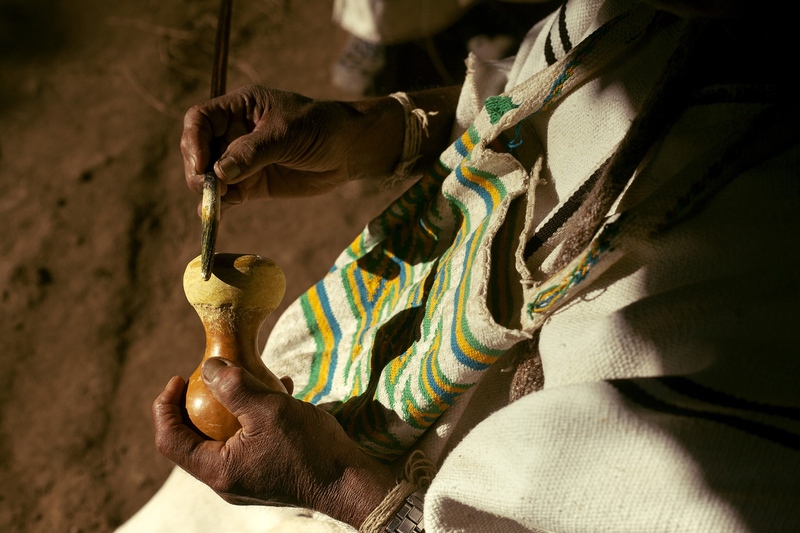 They are part of the cultural heritage of these peoples and the war on drugs has affected them, since they have been left in the midst of political, economic and violent dispositions. 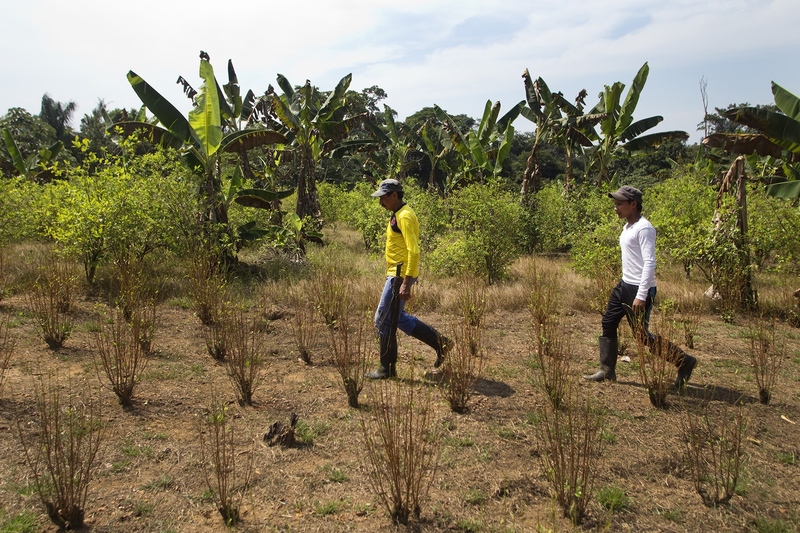 Overview of a field planted with coca leaf variety "dulceamarga" (bitter sweet) in the region of La Paz, in the Guaviare. Raul Angel Cuadros, grower of coca leaf walks with his oldest son on his farm in the "La Paz", Guaviare. 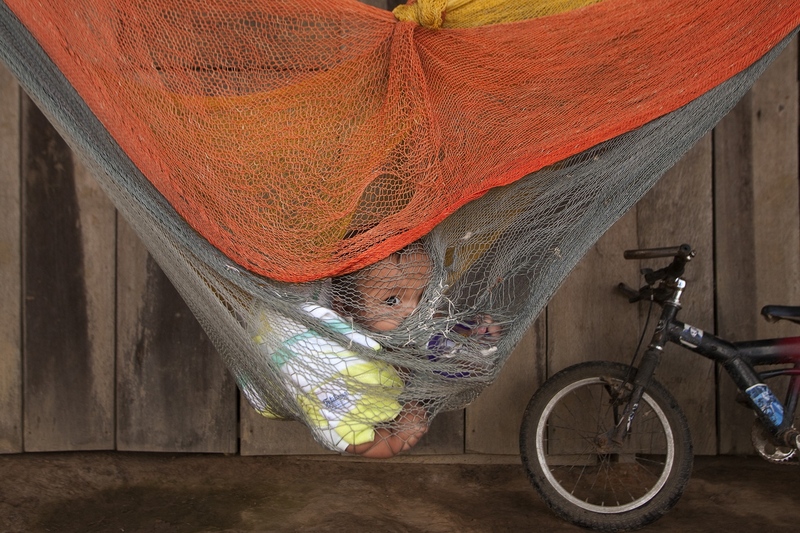 The son of coca leaf growers plays in a hammock in the area of Puerto Colombia, Guaviare, Colombia. Otto Felix Forero collects coca leaves on a farm located within the Nukak National Nature Reserve, in Guaviare, Colombia. Otto has been doing this work for more than 20 years and has thus brought his family forward. The raspachines protect their hands with mosquito net fabrics that entangle their fingers. 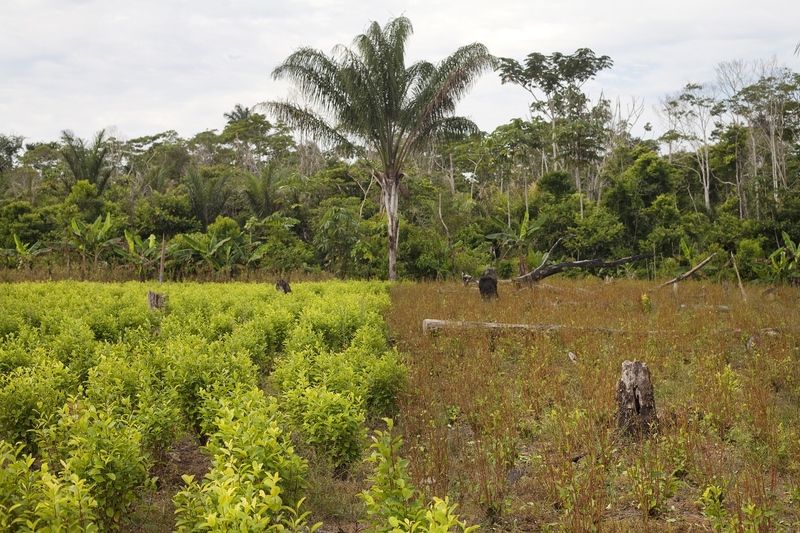 Coca crops in the Nukak National Nature Reserve in the Department of Guaviare, Colombia. 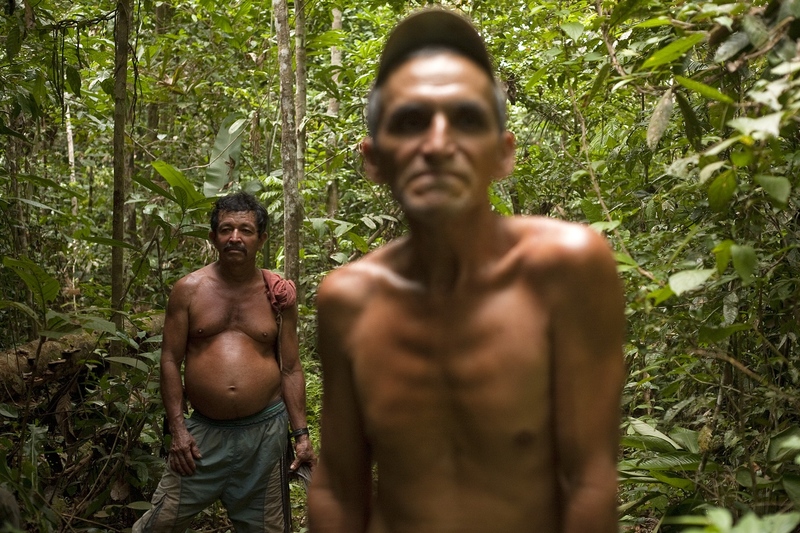 Francisco Manuel García (r) and Otto Felix Forero (l), pause in the jungles of the department of Guaviare, after finishing their day of work as "raspachines" or coca leaf collectors, which they have been doing for more than 20 years. Mr. Nelo has over 20 years collecting coca leaf in the Guaviare area. He is from Itsmina, Chocó, on the Colombian Pacific. 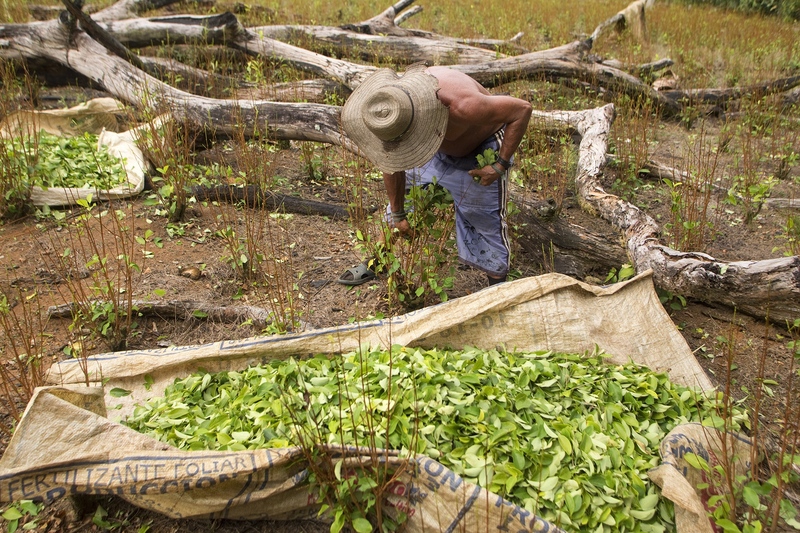 Otto Felix Forero collects coca leaves on a farm located within the Nukak National Nature Reserve, in Guaviare. Otto has been doing this work for more than 20 years and has thus brought his family forward. Five years ago he worked in Bogotá as a construction worker, but he did not earn the same as being "raspachín" or collector. 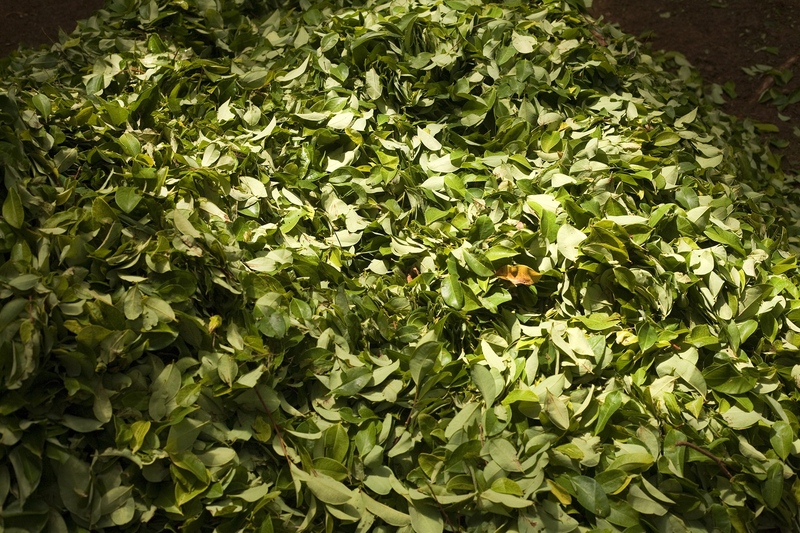 A pile of coca leaves of the variety "Dulceamarga" (bitter-sweet) after being collected in one of the farms within the Nukak National Nature Reserve in Guaviare. 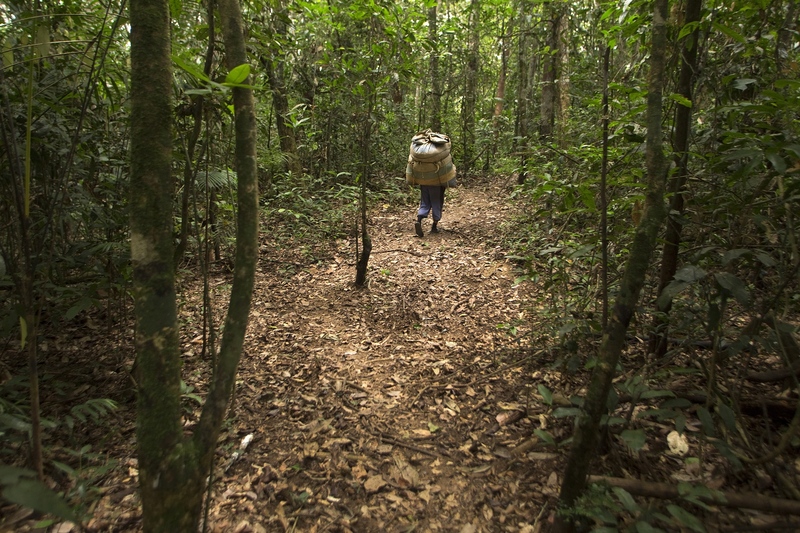 Otto carries a load of more than 55 kilos of coca leaf inside the Nukak National Nature Reserve, in Guaviare. Otto has been doing this work for more than 20 years and has thus brought his family forward. 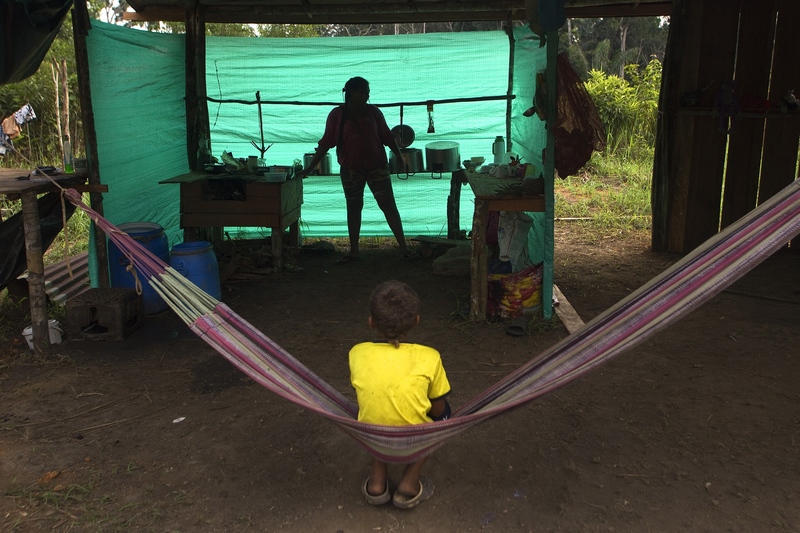 Aida Rodriguez Sanchez and his son Estiven on his farm in the La Paz, Guaviare. 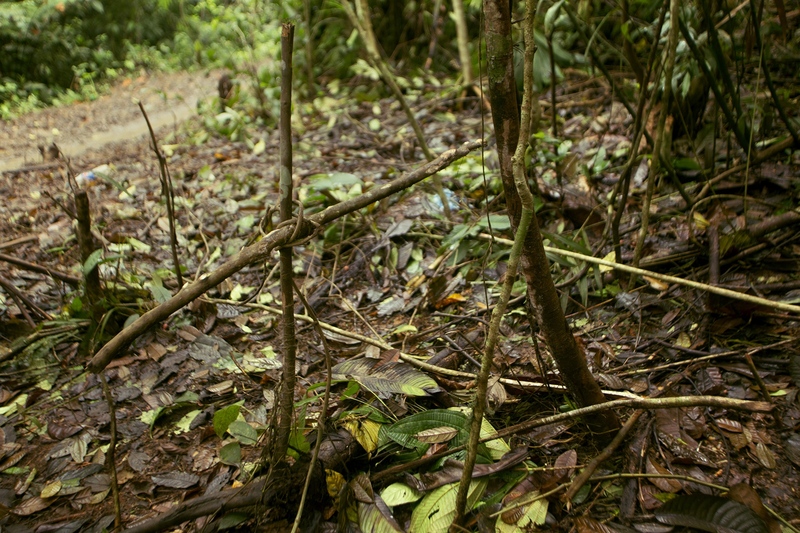 Aida survives picking coca leaves, as the great majority of inhabitants of this area of Colombia. 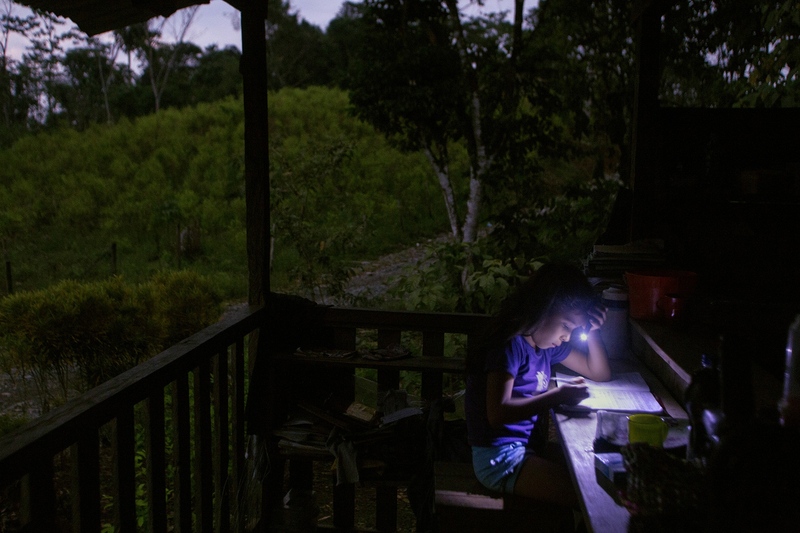 A girl studies at home in the middle of coca leaf crops, in the area of "El Tandil", Nariño, Colombia, where anti-narcotics police shot and killed more than 7 coca growers in confusing events that occurred in October of 2017. 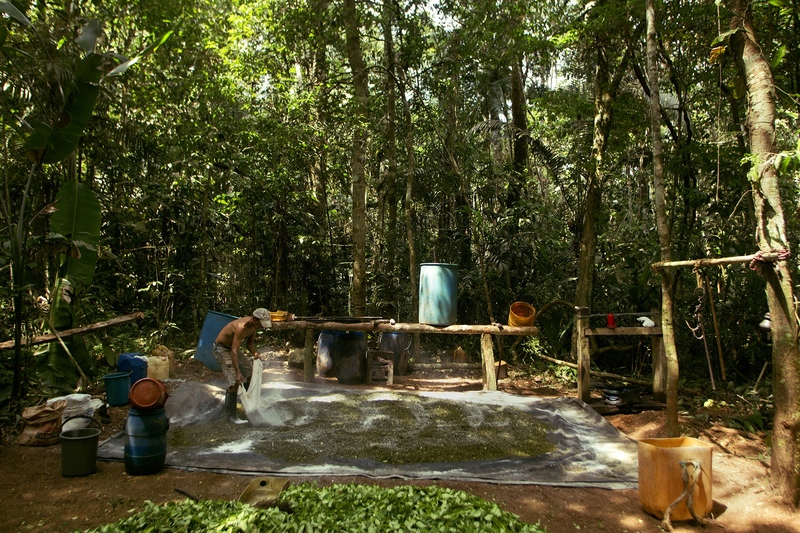 A man adds lime to the coca leaves in addition to other chemicals, as part of the manufacture of coca base, in an unknown location in the middle of the rural area of "La Paz", Guaviare, Colombia. A man shakes with his hand a preparation of coca leaves, gasoline, cement and other chemicals as part of the manufacture of coca base, in an unknown location in the middle of the rural area of "El Tandil", Nariño, Colombia. 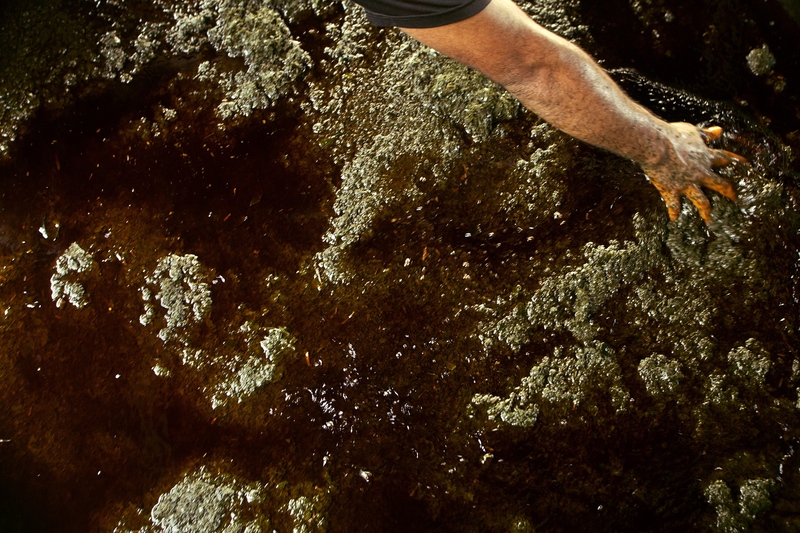 Final combination of the extract of coca leaves, cement, lime and other chemicals with sulfuric acid that gives the coca base as an intermediate result. Rural Area of "La Paz", Guaviare, Colombia. 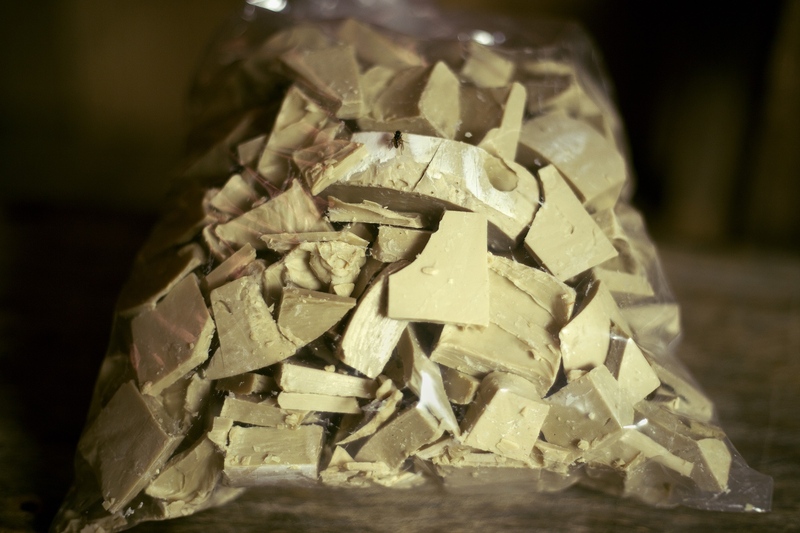 Base of coca packed, ready to be delivered to drug traffickers who will transform it into cocaine. Rural Area of "La Paz", Guaviare, Colombia. 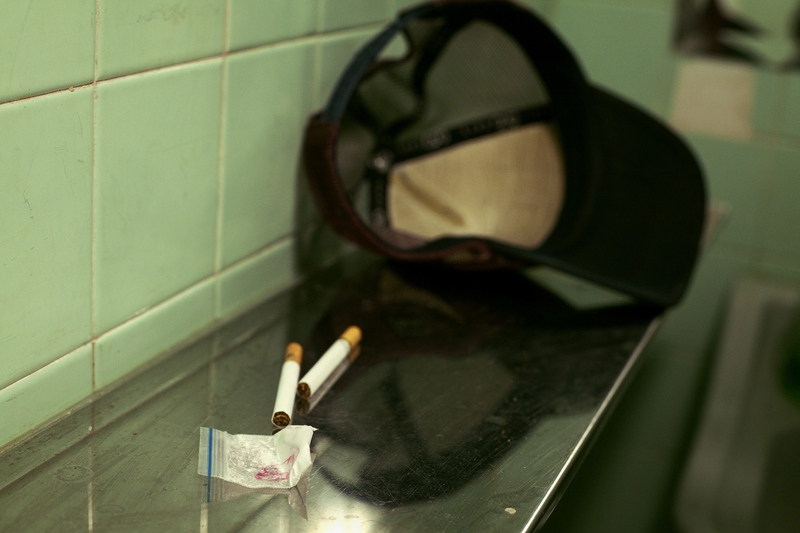 Dosage of cocaine, belonging to Andrés Cuestas or "Putapunk", a drug condomist, in the city of Bogotá, Colombia. 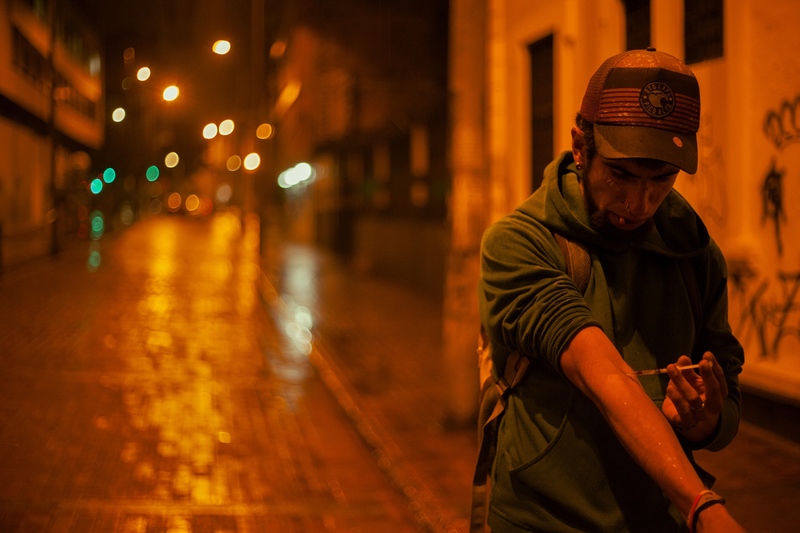 Andrés Cuestas or "Putapunk", a drug co-consumer, applies an injection of cocaine (a very rare form of consumption in Colombia) in the city of Bogotá, Colombia. Alejandra Rodríguez and Sebastián Heredia (not in the photo) are habitual consumers of heroin. They work from home in a Call Center of a foreign company. Bogota Colombia. 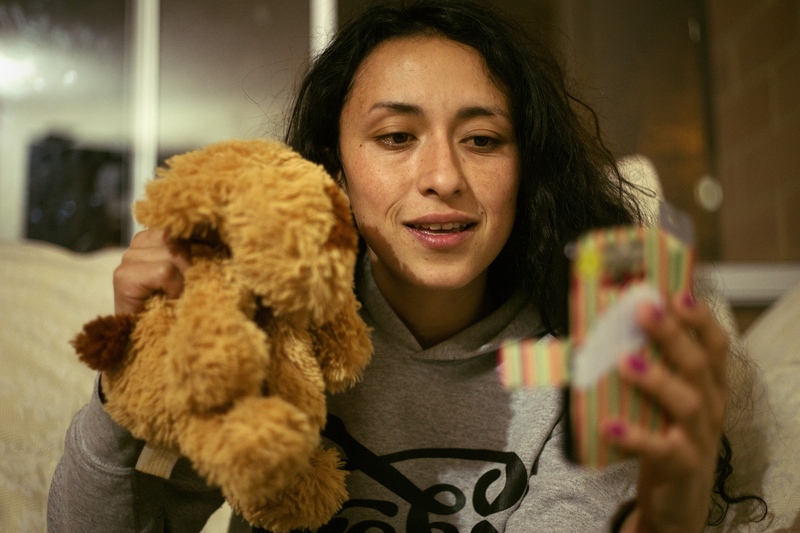 Alejandra Rodríguez greets her daughter through a video call, she is a habitual consumer of heroin. Work from your home in a Call Center of a foreign company. Bogota Colombia. Alejandra Rodríguez is a habitual consumer of heroin. Live and work with your boyfriend. Both work in a Call Center of a foreign company. Bogota Colombia. 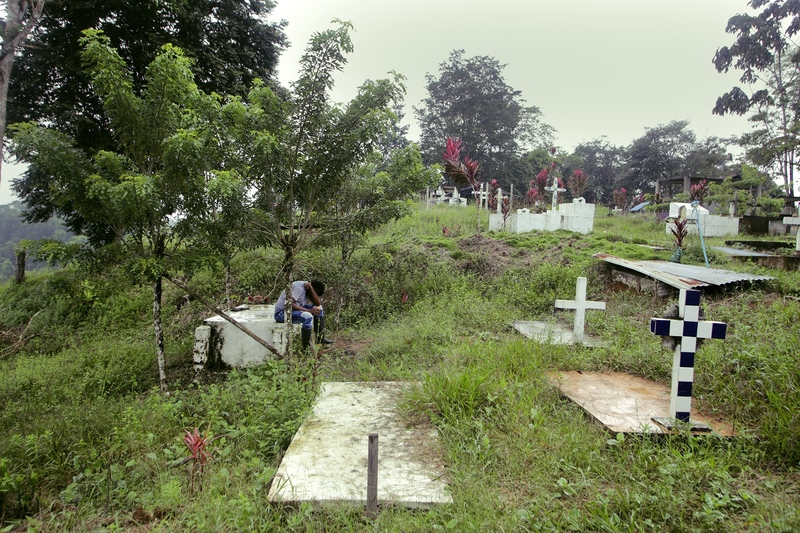 Place where anti-narcotics laundering members opened fire on coca growers and inhabitants of the area, killing 7 people. Rural area of "El Tandil", Nariño, Colombia. 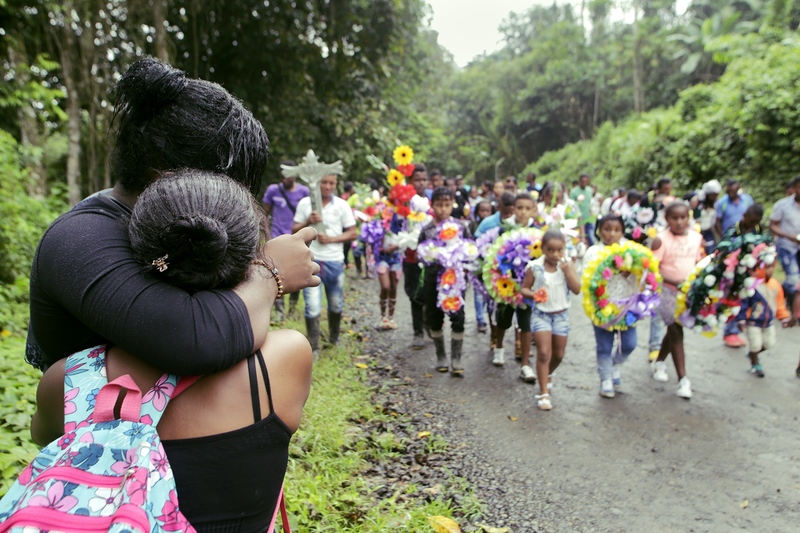 Celebration nine days after the burial of one of coca leaf growers killed by the Antinarcotics Police of Colombia, in "El Tandil", Nariño, Colombia. 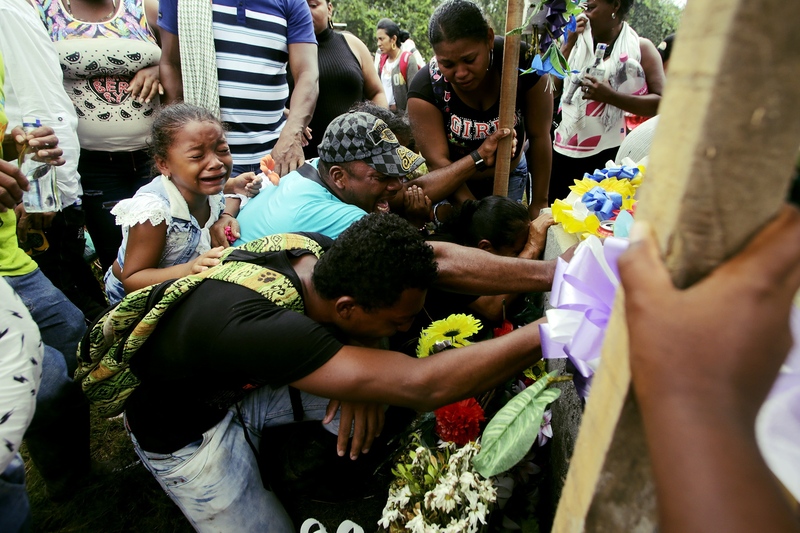 Relatives of one of the dead in "El Tandil", Nariño, Colombia, mourn their loss in the cemetery of the area of "El Playón"
A group of peasants voluntarily eradicate the coca bush in a "Minga" or collective effort of the community, prior agreement with the national government in the framework of the PNIS (National Program of Substitution of Illicit Use Crops) in the area of Carmen Bajo in the municipality of La Montañita, Caquetá, Colombia. 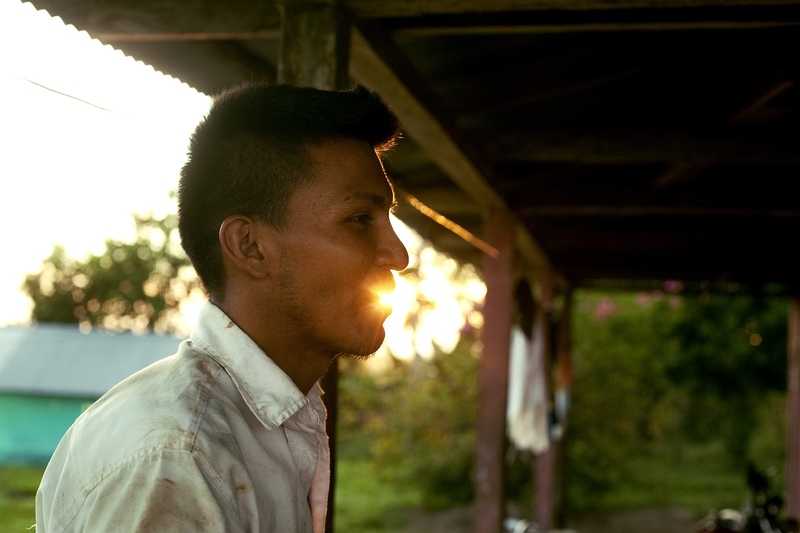 Hans Anderson Figueroa, 23 years old, chatted at dusk in the farm "La Isla" SAS, which is a milk producer in the inspection of "El Triunfo" in the municipality of La Montañita, Caquetá, Colombia. Since the peace agreement was signed the situation has changed, since there are no battles or clashes between the army and the FARC guerrillas, but they are still waiting for the government to fulfill the promises and commitments. what he has done with the peasants. 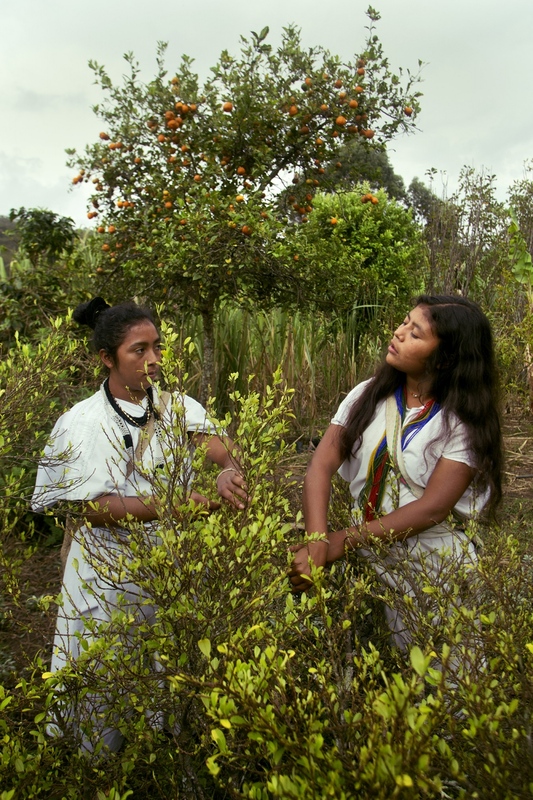 Daniela Villafaña and his cousin of the Arhuaca ethnic group, collect coca leaf for the daily ceremonies that this population has. 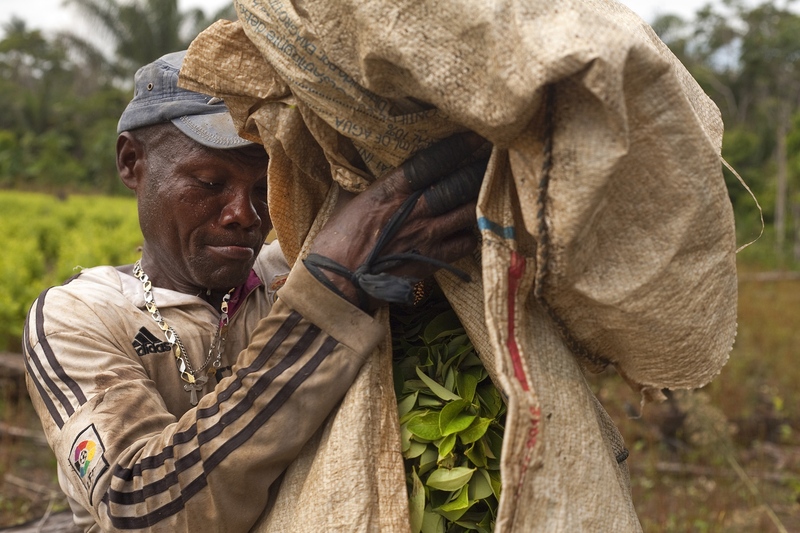 The coca leaf is fundamental for the cultural development of the peoples of the Sierra Nevada of Colombia, as well as for other peoples throughout Colombia and South America. It is not considered a drug but a sacred plant and in that sense the natives profess a deep respect. 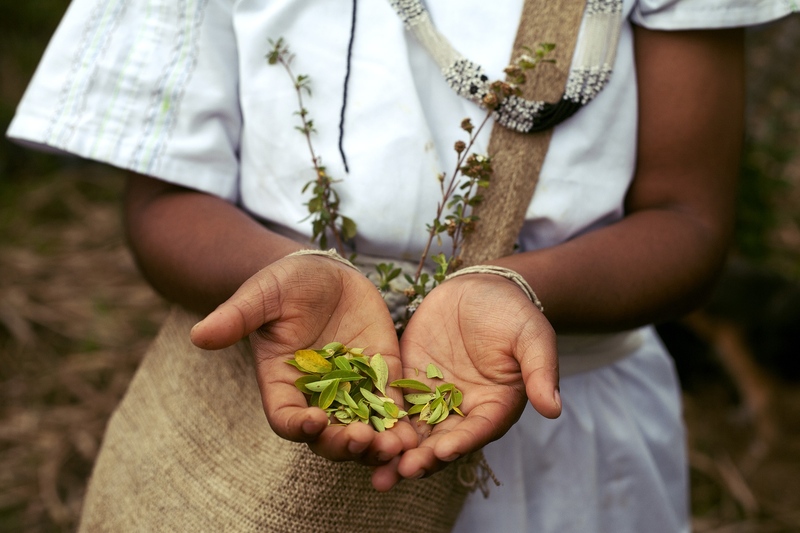 Daniela Villafaña of the Arhuaca ethnic group, shows in her hands coca leaves for the daily ceremonies her people have. Joaquín Robles, Daniela Villafaña and his cousin of the Arhuaca ethnic group cook coca leaves for the daily ceremonies that their people have. 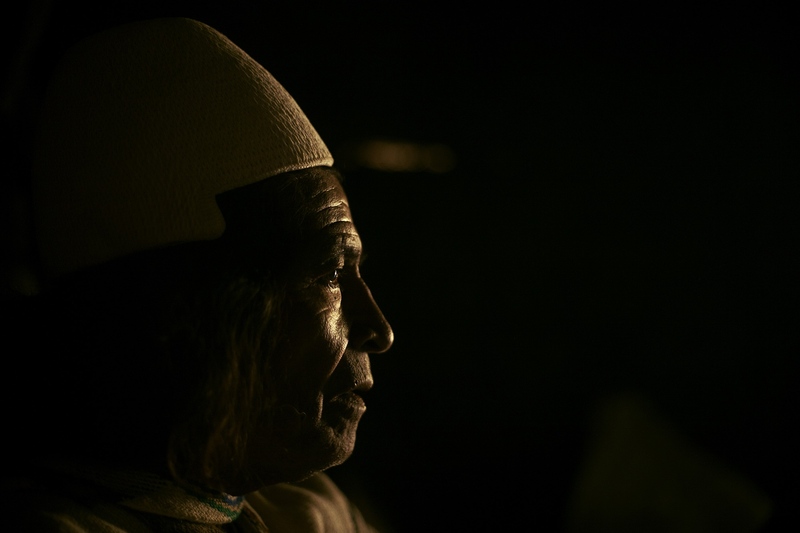 Mr. Isaías Torres Villafaña is an indigenous of the Arhuaca ethnic group, uses coca leaves to communicate with his ancestors through the "poporo", where he combines lime, crushed sea shells and coca leaves, in a recipe that this ethnic group has been using for many generations.